i'd like to keep track of what i have watched already. Over the years i've watched many movies etc; too many to remember them all. Which isn't good, because i'd like to watch all movies from some actors/directors etc. So i always have to think hard, when i go through the lists of those people, which titles i haven't watched yet. I have to watch trailers or read the plot to remember, which both i hate, because it costs time and i don't want to be spoiled. By reading some of the articles on here, i came across the check in feature, but that doesn't fulfill my needs completely. It only helps a little, that i can see - after selecting a title - that i have watched this already. There are other websites out there, which take the data from imdb and provide the feature i'm talking about. The following picture shows an example. The site doesn't have lists or tables; they chose a poster format, where the icons are below each title. This could be a useful alternative to watch lists for imdb as well. 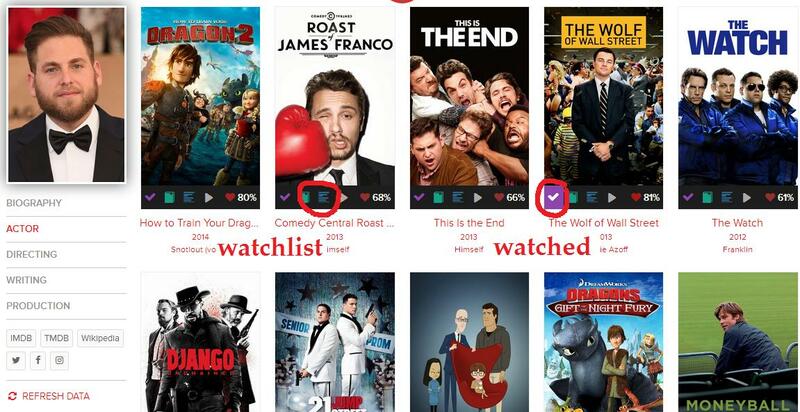 Here i marked two titles with a "D" for done and one title with a "W" for watchlist. You can substitute these letters with stylish icons as well. Next to the heading i added the progress. We currently got 30 movie credits for this actress. "2/30" i have watched already. This adds up to about "6 %" watched. From the remaining 28 titles, i got one on my watchlist. You can argue about the counting method, because you can also have already watched titles on the watchlist, if you want to rewatch them. I'm not sure either, what would be best, but i think i'd kinda like to see the number 28 go down with every new title that i watch. Same as i like to see the watch percentage go up. The reason why i want this on imdb is that i love imdb. I use it for years. But now that i have found these other sites which provide this watch feature (that i want for ages and have realized poorly on my own), i rarely browse through imdb anymore, because i pretty much have the same lists on the other sites, where i mark stuff watched on a daily basis. But imdb is the bigger site. It has a better backbone/performance and the data is more accurate/up to date. Is there any chance, that such a feature might be added to imdb as well? The best way to track watched movies is to rate them. Once rated, the movie is in your 'Rated' list that can be searched and sorted in some ways. An annoying thing here is the rated mark is not shown anywhere except lists - this is the real problem. The same is for movies selected to watch later (watchlist). They may be (un)selected with checkbox as the other sites do, but on IMDb they can be operated only in lists (yours or other users). So, there is nothing about 'new' features, but the existing features really need to be accessable on all pages (titles, actors, etc. ), not only lists. But it could probably be better integrated into the site. Anyway, thank you very much for pointing it up! Not so comfortable, but may be used as link-substitution. Thanks for this. I won't use it though, because it's just too messy compared to the real actor lists. And again, i would have to rate every episode etc to get it done. That's too inconvenient if you've already watched much, but have not rated everything after watching it. Just clicking a few thousand times the "watched already" button would be enough work. It can't be hard codingwise to just duplicate the rate button and just make it on/off for watched already. That would be okay-ish for the start. The other features i mentioned would be the icing on the cake. On the page I referenced you can click the star to mark a title as seen, and it counts in the stats. This carries over to other seen lists (eg, for other actors in the same film), but on the other hand the seen status is not displayed in other places such as title pages. Ahh, now i got it. I thought that was only active by rating it. It's a start, i guess. I will start marking titles as "seen" and i hope they expand this feature or integrate it in the actor etc lists as well. It's a bummer, that the "seen" feature doesn't seem to work on the actual title sites. There you have to rate and can't just click "seen". Would be great, if imdb could add this there as well. It's even more complicated to go to the 'How Much Have You Seen?' link and search for the title again; just for that. PS. there doesn't seem to be a "seen" list. The ratings list only shows 1-10 star, but not the seen. And the "seen" titles don't show up under Check in, which is odd: isn't that kinda the same?